Imagine an experience that’s better than the best: a level of excellence that reaches so high it can only be called Top of the Top. Grand vistas framing majestic fairways. Immaculate greens forever preened to prime condition. That is the universe awaiting golfers who experience any of the 17 spectacular courses of the Taiheiyo Club Japan. Among the 17 Courses of Taiheiyo Club’s Japan properties are some of the world’s finest championship links. Courses that not only host professional tournaments, but display a refined sense of style and beauty that is exemplary of Japanese aesthetics. “Frankly, I consider the 18th par 4 finishing hole to be the most beautiful in Japan,” said Jumbo Ozaki while playing the Mitsubishi Galant Tour at Rokko in 1997. Today, Rokko hosts the Maruhan Cup Taiheiyo’s Club Seniors Tournament as well as several other pro and pro-am tournaments. Known for dramatic vistas and ideal conditions, Rokko is not to be missed. Nestled in a generously wooded area, Konan is the home of the 2015 Japan PGA Championships, and the brainchild of master designer Shunsuke Kato. Playing Konan’s 18 holes in autumn, when the surrounding foliage is blazing reds and yellows, is a natural delight. And when it’s time to unwind, the clubhouse has nine elegant banquet rooms available for gatherings of all sizes. Taking advantage of the flat topography of the Kanto Plain, this 18-hole course is framed in traditional Japanese foliage. Minori has been home to several ladies tournaments including a showcase event on the 2016 LPGA tour and the Japanese LPGA Toto Classic. It is said that the setting of each hole is as lovely as a classic Japanese painting. Known for his long, blazing drives American Gerry Lester "Bubba" Watson, Jr., (b. November 5, 1978) is one of the few left-handed pros on the PGA Tour. That southpaw swing has earned him two Masters Tournaments in 2012 and 2014. In February 2015, Watson reached a career-high 2nd place in the Official World Golf Ranking. Taiheiyo Club is proud to call Bubba one of its own. Around the world, Japan is famous for the beauty and serenity of its unique gardens, providing space for both recreation and reflection. No doubt, Japanese gardening is a cultural treasure. You can be sure the same rustic styling and attention to detail is on display in the fairways, greens, and even bunkers of Taiheiyo Club courses. It’s not bragging to say you simply won’t find better manicured greens anywhere else on earth. From Narita’s rolling topography and curving marshes, designed by master champion Gary Player, to the strategically demanding Mashiko, a masterpiece of Shunsuke Kato’s featuring holes, divided by red pines and sawtooth oaks, there’s an abundance of both natural and challenging diversity in the Taiheiyo Club portfolio. Our goal is to provide a familiar and comfortable experience for all members in our expanse of courses and resorts. If a member from Tochigi or Hong Kong or an American living in Japan can say, “This is my club," we have succeeded as a premiere golf community brand. While the Taiheiyo Club is a community of more than 16,000 members and has affiliations with five prestigious clubs abroad, instilling a sense of camaraderie and “belonging’ Is most important to us. Be part of something big, and be part of something special. There are more than 200 events held at Taiheiyo Club Courses throughout the year, including the “Mitsui Sumitomo Visa Taiheiyo Masters” at the Taiheiyo Gotemba course, the “Maruhan Cup” seniors tournament at the Rokko course and a co-sanctioned tournament between the Japan Ladies PGA and LPGA, the Toto Classic, at Minori course. As a member, you'll have the chance to qualify and compete. This Mulligan is no mistake. 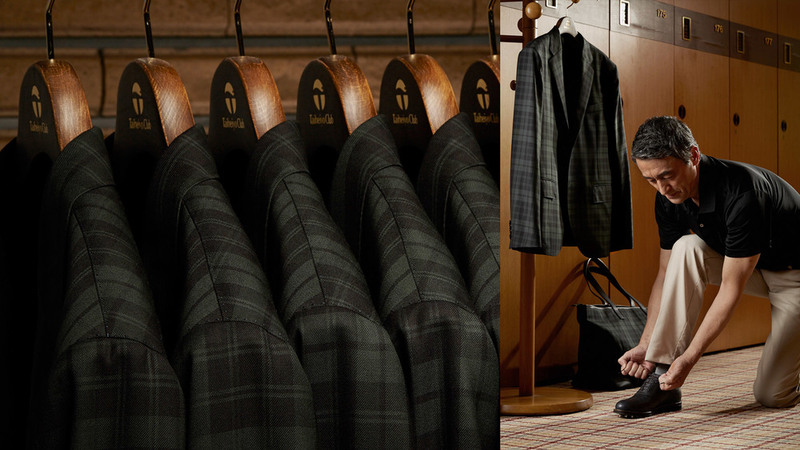 You’ll know you’ve truly arrived at Taiheiyo the moment you slip on your Mulligan Check club blazer. Well, it’s not simply a blazer, it has been exclusively designed for the Taiheiyo Club members by Italy’s renowned Cerruti design house. What’s more, it meets the exacting standards of the Scottish Register of Tartans, as an official, one-of-a-kind Scottish Tartan design. Be prepared to be impressed, excited, and indulged, because that’s just what’s on the menu at Taiheiyo’s Select the Club pro shops. It’s not often that bespoke service is provided at a course operated pro shop—and that's what makes Select the Club beyond compare. Select the Club in Gotemba features a workshop where you can get your current gear optimized. Need to re-shaft or re-grip? Our staff technicians (but we prefer to call them craftsman) are happy to serve your every need. Nearly half of the gear and sportswear on display at, the “Special Closet and Craftsman’s Shop" in Select the Club is designed and produced specifically for Taiheiyo and bears our club seal. We’re proud to admit, that polo shirts and jackets bearing our logo have become something of a status symbol overseas. Today there are three Taiheiyo Select the Club shops in our family at the Gotemba, Gotemba West and the Karuizawa courses. If you are looking for something special, something that fits only you, or something that you won’t find anywhere else on earth, pay a visit to a Select the Club pro shop. “Villa the Club” is Taiheiyo’s luxurious and gorgeous accommodations offering. Our latest branded resort in Karuizawa, features 3 restaurants and rooms to accommodate 200 visitors. You can also find other incredible stays in Shirakawa and Gotemba West. Playing 18 holes is enough to make anyone hungry and thirsty Not to worry, Taiheiyo Club has the after-golf indulgences to please most anyone. Whether you prefer Japanese, French, Italian cuisine or even barbeque there’s a Taiheiyo Club restaurant ready to serve you and your party. Ryo Ishikawa himself claims that he could eat Gotemba's french toast every day. When you call your club “The Top of the Top” there’s no question about the kind of quality, service, and exclusive community you are reaching for. Yes, Taiheiyo Club stands for excellence, Japanese service, and unwavering quality, but we also stand for community and collaboration. We currently have reciprocal club agreements with six of the world’s most prestigious golf properties. We have started the Taiheiyo PGA Golf Academy to introduce the joys of the game to youngsters and casual players. And through our new relationship with Maruhan Corp. we are seeking to expand out resort and banquet facilities. Make no mistake, those who put on The Mulligan Check blazer today stand for something special, yes it’s Our Club, Our Course, but it’s also your club, of course. Established in 1971, the Taiheiyo Club features 17 courses in Japan and reciprocal arrangements with 5 courses abroad. Having hosted more than 200 events a year, including some of the world’s top pro tournaments, the Taiheiyo Club has long been satisfying the exacting demands of the world’s elite golfers. Taiheiyo properties also include five-start restaurants and hotels, “Select the Club” a bespoke pro shop in Gotemba, and “Villa the Club” a resort in Karuizawa. In 2014, Taiheiyo joined forces with Maruhan Corporation to insure a future of excellence in service and play that will continue to set par for golf in Japan and around the world. Taiheiyo Club is committed to increasing the popularity of golf both in Japan and around the world by teaching the skills that make golf more exciting for players at all levels. In 2015, the Japan Professional Golfers Association (JPGA) decided to form a public golf academy with base courses in Kanto and Kansai. The goal is to encourage the development of skills for all levels of golfers targeting both juniors and general amateurs. Courses are geared towards both individuals playing for fun and those who are serious about becoming pros. To support the JPGA agenda, Taiheiyo renamed its Mashiko course, the “Taiheiyo Club Mashiko PGA Course” and opened the Taiheiyo Club PGA Golf academy. We are looking forward to bringing up Japan’s next generation of golf lovers and perhaps some golf champions.